Everyone wants to take that trip of a lifetime. They want to wow friends and family with that perfect photo – sitting on a beach, fruity cocktail in hand, watching a stunning sunset. If only travel were so easy! That’s what we thought our first big backpacking trip to Thailand and Laos would be like. Even though some parts were like that, we made all the travel mistakes. I wish someone had told me how to go about planning and preparing for a trip like that. There’s a lot standing in between you and that photo opp – getting time off work, booking flights, researching the place you’re visiting, budgeting – the list goes on and on. We love to travel, and we also know how much work it can be. Based on our experiences, we also know it’s not quite as good when you don’t know what you’re doing. It took two tries to go tubing. I was robbed! I had an envelope of cash in my backpack (I know!). It had a lock on it and that bus ride wasn’t that long. Someone was in the storage compartment under the bus picking locks and took a nice big chunk of that money. All my savings for that whole trip (mostly) gone. On Koh Tao Island, we paid $10 for a ride to our guest house from the pier. We could have walked 3 minutes up the beach for free (it would have been nice for him to tell us, geez!). I brought my entire summer wardrobe (most of which didn’t fit – thanks a lot, Chinese food!). A friend had advised me to bring and an empty backpack. Did I listen? Nope. I ended up purchasing so many new things I had to get a new bag just to get everything home. 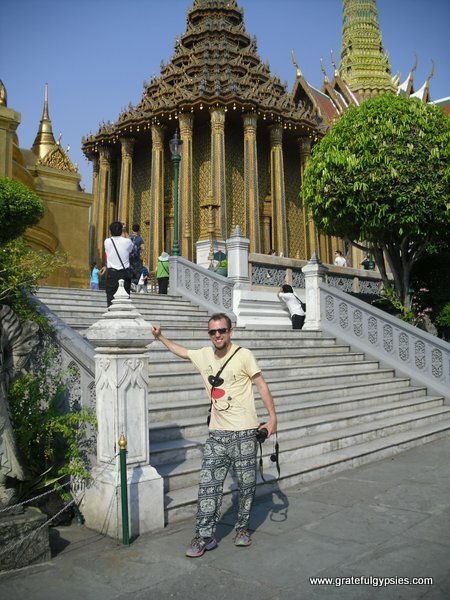 In Bangkok, Sasha showed up at the Temple of the Emerald Buddha wearing shorts, a big no no! To get in, he had to buy some silly elephant pants from a vendor on the street and wear them into the most sacred site in the country. We missed the best parts of Khao Sok National Park because we didn’t do any research. Oh, and we also stayed in the worst “bungalow” in a place where we saw the staff encourage a toddler to smoke. 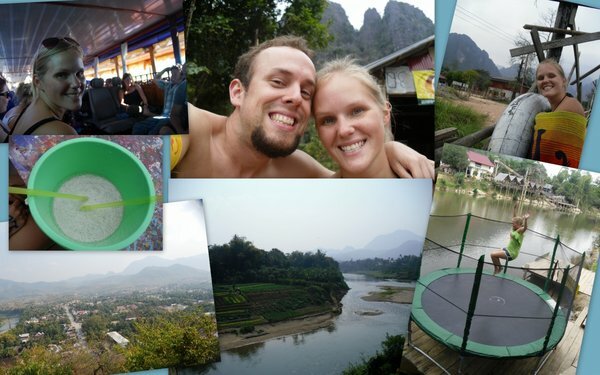 In Vang Vieng, Laos, we showed up for tubing – one of the biggest parties on the banana pancake trail – way too early without tubes. I got sick after drinking Lao Lao and spent the day running to the bathroom. We failed at “in the tubing” so bad we had to extend our stay a day to try again. We brought Laos Kip back to China, where they, of course, would not exchange it for anything. Nobody wants the currency of Laos, not even the border officials there. Once the glow of that first big trip wore off, we realized we actually didn’t do such a great job at the whole traveling thing. Many of those travel mistakes could have been easily avoided. We had survived the trip, but there was certainly room for improvement. Over the next two years, we had plenty of chances to practice. We went on so many trips around China, as well as crossed a few other countries off of our travel bucket list – visiting Japan, Bali, Mexico, and the Philippines. 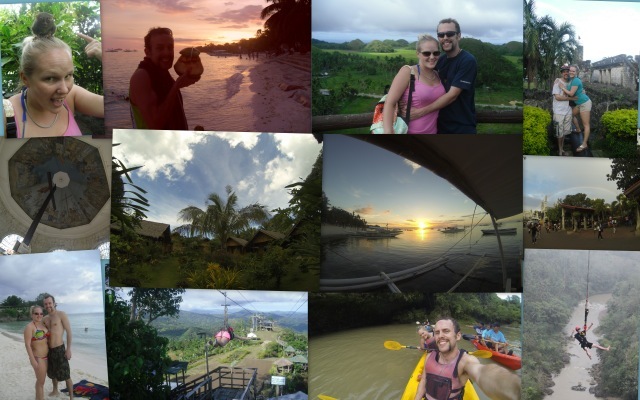 We took trip planning more seriously and found that our travels were getting better and better as a result. Our trip to the Phillippines was much better planned. By the time we set off on our gap year, we were far more confident in our abilities. There were still some problems and mistakes here and there, but we ended up doing better than we could have ever expected. We knew what to expect from each country we visited. Our packing job was way more organized. We had a solid route, and most importantly, we had saved enough to take a full year off. Thanks to Sasha’s awesome budgeting skills we were able to travel the full year, plus go back to America for five weeks, do some backpacking in China, and still have enough left to pay six months rent when we arrived in Kunming. Oh, and we didn’t go on any lame day tours. The USA leg of our gap year. 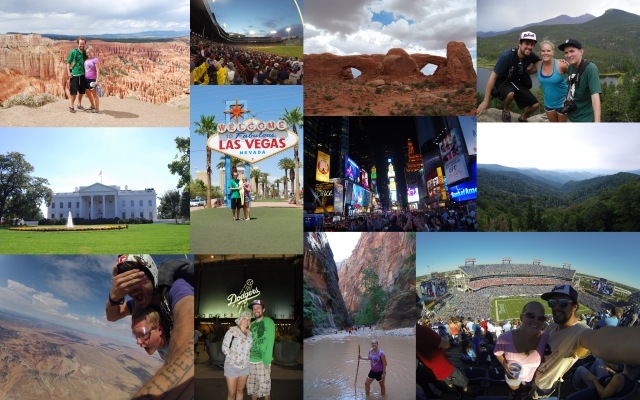 Since then, we’ve successfully planned and executed several trips, both big and small. We’ve also helped plan the travels of friends, families, and even strangers who have reached out through our site. Travel can be intimidating, especially to foreign lands for long periods of time. However, we know from experience that with the right system in place, it’s possible to have a great time and do it all yourself. All the resources are there for you to plan and take that trip you’ve been thinking about. Let us help you find them and get to work turning your travel dreams into a reality. 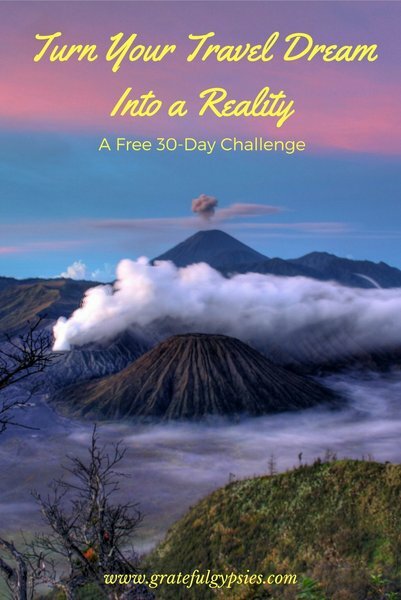 Sign up here for our travel challenge Turn Your Travel Dream Into A Reality. Starting on May 17th, we’re running a 30-day workshop to help you do just that. Through a series of e-mails, you’ll get tons of practical tips and advice about all the stages of travel planning. It’s totally free to join, so sign up today and let’s start planning that trip! We’ll even throw in our e-book How To Travel Southeast Asia On $30 A Day as a way of saying thank you. AND if you sign up by May 17th, you’ll be entered to win a 30-minute Skype call with us where you can ask us anything about planning your trip. I can’t wait for this to start! Neither can I! I’m super pumped. I wish I had this a month ago! haha I just arrived in Thailand two days ago and feel like I’ve already made my fair share of mistakes, but I’ve been enjoying it. It’s good to know I’m not the only one who has been so underprepared, but thankfully I have a while left and can do a lot more research for the rest of my trip! You are definitely not the only one who’s unprepared. That’s why we’ve developed this system of planning. It’s helped us so much we want to share it with everyone. Happy to hear you’re enjoying Thailand. It’s such a cool country. Those elephant pants are classic… I know many people who have done the same thing – turned up to the main temple in Bangkok in a singlet top. The good ol’ sarong/shawl comes in handy a lot. Sounds like you’re both having a lot of fun on your adventures. Classic is right! After that mistake I made sure to always have some sort of cover up with me. I almost didn’t get to go to the top of the main temple in Angkor Wat because I set out wearing shorts. Good thing I caught myself and went back to change!